sepia saturday for the last two weeks have featured photos of my parents, rita and shan, before they met, leading up to today post which celebrates their upcoming 59th wedding anniversary. 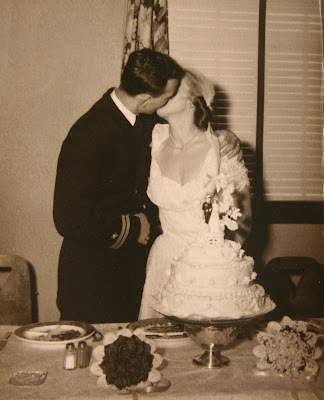 my parents wedding ceremony took place in harwood's st. michael's catholic church on march 31, 1951. it was a small wedding party, in addition to the bride and groom, there was jean, my mother's best friend as the maid of honor and my father's brother carl, as the best man. the church they married in was a charming old wooden building which was located on harwood's main drag. I don't know why, at some time the church moved down the road into a (new) boxy brick building. it was this brick church I remember most going to when I visited my grandmother. however, over the years even this church closed. the brick building is now the home of some small pentecostal protestant community. my parent's first dance as a married couple - wouldn't you love to know what song they chose? wouldn't it be wild if it turned out to be the song I chose for today's song! nice kiss. one thing I have long thought of as a gift is how my parents have always been at ease and natural when it comes to displays of affection with each other. unlike some of my generation, who never saw their parents kiss, in public or private, my parents, have been wonderful role models when it comes public displays of affection; so, I guess I come by my huggy-kissy behavior naturally! 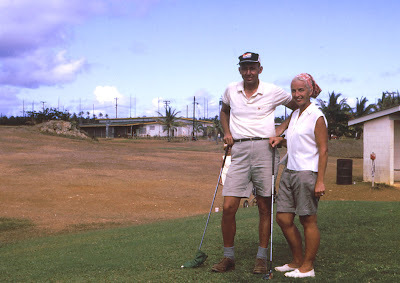 my parents were avid golfers - and according to anyone who played with them they were also skilled golfers. perhaps one of the cruelest effects of aging for both my parents is that they are no longer able to golf. however both of them did play up until they were in their early eighties. since I have never asked my parents if they have 'a song', I chose today's theme song based on two criteria: 1) it was a hit song for the year they got married (1951) and, 2) the love of my parents share and have expressed for these past 59 years is unforgettable. happy anniversary mom and dad!! click for more sepia saturday posts. 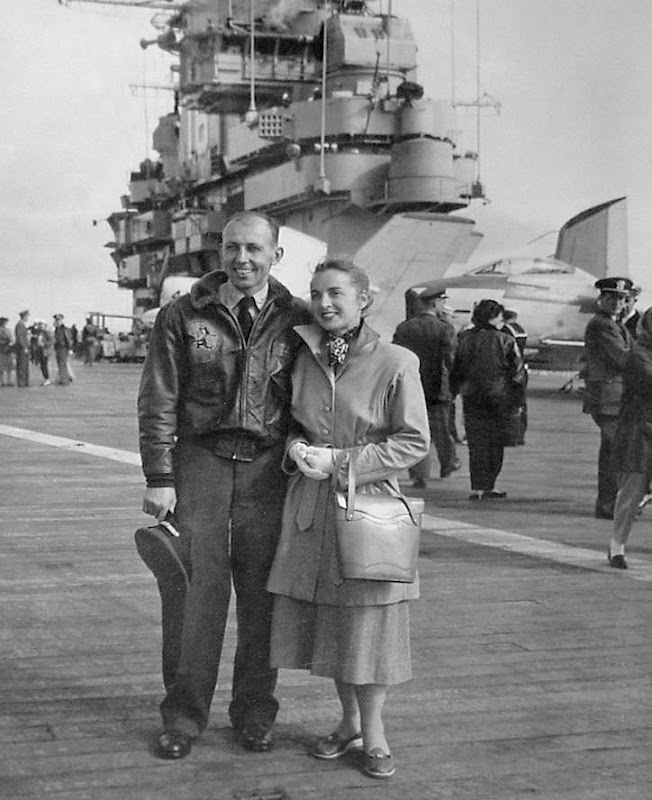 Love that image of your parents on the aircraft carrier. It makes me think that nowadays we're very lucky to have such easy access to digital cameras, camera phones etc. which lets us take a lot more pictures - especially of the relaxed kind. But we don't see as many professional photographers around or as many of the posed photographs. I think both the posted and non-posed pictures reveal something about people. I think 'Unforgettable' is a perfect choice for such a charming couple. Your mother's wedding ensemble is gorgeous! I love tea-length dresses, and the hat sets it off perfectly. But what's most refreshing is her shoulders are covered. I'm sick to death of strapless wedding gowns. I can count on one hand women who look spectacular in a strapless gown for *any* occasion, and three passed away years ago. That said, Happy Anniversary to what looks to be a *truly* happy couple! Fabulous pictures. Your mother was very beautiful. The Felix the Cat is probably incredibly valuable now. What a treasure. Happy Anniversary to this unforgettable couple! They are such beautiful people. I loved this post, Kimi. What a handsome couple! The gown is beautiful -- I notice that her maid of honor's gown echoes the neckline. So flattering! And I love the bouquets. . . so perfectly proportioned for the lines of the gowns. How wonderful that they were openly affectionate. How amazing that they were skilled golfers into their 80s. Funny how this post makes me happy and sad, all at once. Your folks are SO lovely and SO in love! The photos make me feel good! Did you print your posts as a little book for them? What a beautiful and handsome couple they were and still are! It may have been a small wedding, but it doesn't get any more glamorous than that. In every picture, they look so happy and in love. You've quite few photos of your mom and dad.......seems endless. Despite the ravages of time, the togetherness means more than a lot of other things they may be missing. how's the film fest coming along? what a stylish couple - these are lovely photos, I do like her wedding dress and going-away outfit. What a wonderful series of photos. I really enjoyed the way you've used photos from different periods in their lives to tell their story. Beside the actual wedding photo, the one of them on the aircraft carrier is my favourite. The look on your dad's face tells it all. In every way that is a wonderful post : a pleasure to read from beginning to end and the photographs are the icing on a most substantial cake. As I have told you many times before I always look forward to your blog being the next of my blog-roll.